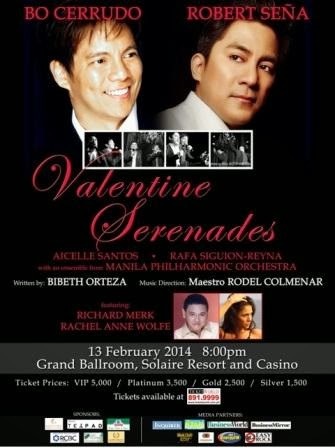 Celebrate Valentine’s Day with a special evening of music and dinner for friends and lovers with premiere classical balladeer Bo Cerrudo and powerful tenor Robert Sena in “Valentine Serenades” happening on February 13, 2014 8:00 pm at the Grand Ballroom, Solaire Resort and Casino. Accompanying our two world-class acts are Aicelle Santos, Rafa Siguion-Reyna and ensemble from Philharmonic Orchestra. Experience a Valentine’s show to remember written by Bibeth Orteza and musical direction by Maestro Rodel Colmenar. As the show promises a blend of classical, OPM favorites as “Kundiman”, Broadway melodies and smooth jazz, this special evening will also feature musical performance styles of Richard Merk and Rachelle Anne Wolfe. Bo Cerrudo released two albums, namely: an eponymous debut effort which spawned the hit remake “Pag Tumatagal Lalong Tumitibay”, and the 90’s ballroom dancing-inspired Retro Dancing. It was in musical stage plays where his discipline and spontaneity were honed and polished. He was able to snag plum roles in major musicals, among them Wang Ta in “Flower Drum Song”, Tony in “West Side Story”, Rama in “Rama Hari” and the Manila run of “Miss Saigon”, to name a few. He dazzled foreign audiences via sell-out concerts in the US, Asia, Middle East and Europe, even performing on several occasions as ambassador of goodwill for the Philippine Department of Tourism. His series, “Cerrudo: Classico” is the longest-running concert series of its kind, having staged over 100 shows since its inception in 2005. For Bo Cerrudo, the past 25 years have been an incredible journey. He recently triumphed anew as the 2011 Aliw awardee as “Best Male Performer in Hotels, Music Lounges and Bars”, further sealing his stellar status in the entertainment industry. Meanwhile, Robert Sena began his career as a rock singer but later discovered his passion for stage and classical music. He is now an accomplished and multi-awarded actor( Gawad Buhay-Philstage, Aliw Awards, National Press Club’s “Tinig Awards”) and singer who has done numerous concerts, TV, film, musicals and stage plays both here and abroad. Notable productions include: Miss Saigon (London, Germany & Manila), Jesus Christ Superstar (London & Manila), Hey Mr. Producer! (London), “Katy” The Musical, Bayan Isang Paa na Lamang, Miong! The Musical, Cory the Musical, Rama at Sita. Skin Deep, Noli at Fili, Spoliarium, Tales of the Manuvu, Juan Tamad at Limang Milyong Boto, RamaHari etc. He has produced a number of albums like DUETO, IDREAM AND SIKA (Jonathan Badon). He has also ventured in producing original Filipino musicals together with Spotlight Artists Centre of which he is the Artistic Director. The company has produced the successful restaging of MAGSIMULA KA and KATY. Currently, he headlines PETA’s “Rock of Aegis” that runs from January 31 to March 9, 2014. Share a romantic musical experience to remember as few of today’s top performers will serenade our guests with emotionally charged rhythms and alluring classical melodies. This Valentine’s Concert is presented by Laurel Media at one of the city’s most popular annual musical events and elegantly intimate atmosphere, Solaire Resort and Casino. Tickets are available at www.ticketworld.com or you may call 891.9999 for reservations.